The Square – Tin tin taare…log bechaare! I am neither an activist (not even the arm-chair/facebook/twitter/etc. kind) nor an Egyptian, and yet, I found myself visibly shaking as I was watching “The Square“. I went through a roller-coaster of emotions through the 95 minutes of this extraordinary film – I was exhilarated, shocked, enraged, overjoyed, frustrated – I felt utterly hopeless and extremely hopeful – I felt defeated and I felt victorious. The film shows the tumultuous period in Egypt’s ongoing revolution over the past two and a half years. It’s primarily focused on the happenings in Tahrir Square in Cairo – beginning from the first gathering of people in 2011 to protest against the 30 year totalitarian regime of Hosni Mubarak (which was heavily supported by the “pro-democracy” West), to the Egyptian Military taking over after Mobarak’s fall, to then the Muslim brotherhood seizing the power with Mohamed Morsi as it’s leader and to the latest departure of Morsi. The revolution continues. The film depicts how a movement with no clear leadership is shaping Egypt’s history at this very moment. It shows how people unite on a singular idea of “basic rights and fair governance”. 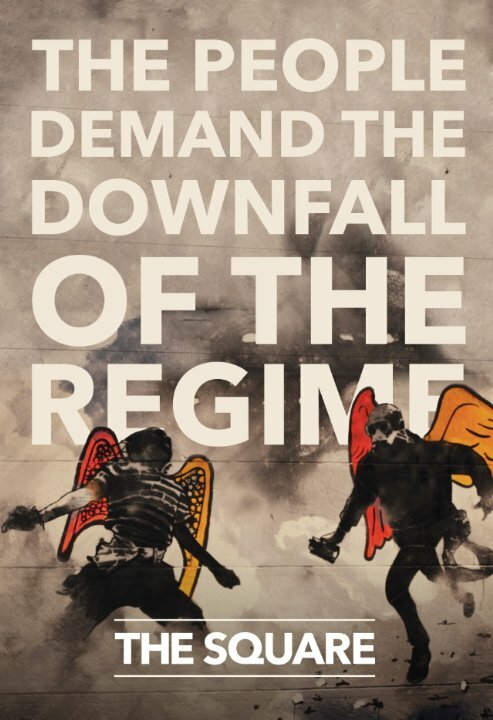 How the fall of one regime brings out the opportunism in another faction leading to a newer version of the very thing the people protested against in the first place. It also shows how these opportunistic leaders pit people against people – a friend against a friend – to foster their hold on power. (None of this should be new news, the leaders of the free world and the not-so-free world have been doing this for years). What makes watching it unfold in this film so impact-ful is because it’s happening NOW – and not just in Egypt. Its happening across the globe – its happening in India. There is similar movement of the people for “basic rights and fair governance” – a movement which is chaotic, which lacks a clear leader, which lacks a clear direction. But there is a sense of restlessness in the people. There is a need for change. What ‘The Square’ demonstrates is that this ‘restlessness’ this ‘need for a change’ is enough. So what if there isn’t a clear path, so what if there isn’t a clear leader! Ahmed, a bright eyed boy, with a sunny disposition and a fire in his heart, who is a key character of the film, says something to the effect that “just the fact that people have realized that they can do this…is for him hope enough”. ghiste ghiste fat jaate hai..jooton jaise log bechaare..
tin tin taare…tin tin taare…..log bechaare. This film has been nominated in the best documentary category in the 2013 Academy awards. Whether, the film wins this award or not is entirely besides the point. As mentioned above, I am neither an activist nor someone who has had to fight for anything remotely close to what people are fighting for. I almost feel guilty writing about this film, but yet, I want to urge each one of you out there to watch it. To watch it just for the sake of those who are literally laying their lives for nothing more than basic human rights. The November 2008 Presidential election would be the third for me. Seeing yesterday’s resounding speech by Obama and talking to a friend of mine about the ongoing political games in the country made me think about my perception of these elections. As far as I can remember, I have never been overtly interested in politics and elections. In my teenage days I was quite callous to politics even though all the adult members in my joint family were quite opinionated politically and had different beliefs and loyalties to different political parties. I turned a deaf ear and a blind eye to all the discussions and debates around me. I wouldn’t say that over the years since then interest has increased, however I can now say that I understand (if only at a high level) the political leanings (left vs. right), the election process and the political machinery to a certain extent. I was about 8 months old in the country and did not really care about anything other than slowly absorbing the new world around me. The entire primary season, the campaign leading up to the now infamous election results went by completely un-noticed. Only on the day that people started talking about the big Miami-Dade fiasco that I tuned my television from Seinfeld to CNN. I did not understand what the fuss was all about, but just by the looks of it, I liked Al Gore and wanted him to come out victorious. Anyway, we all know what happened and then I got to witness the Gore concession speech. Just because I was living in the Washington DC metro area, I and a couple of friends attended the inauguration of Dubya on a cold January afternoon. The only image that stayed with me from that day is a homeless man holding a huge banner on the National Mall which said “Grand Theft Election”. That was 8 years ago. This time around, I knew how the system worked – the primaries, the caucuses, the debates, the nominations, the conventions and all the other shenanigans. I was living in Harrisburg, PA that year which happened to be the capital of a swing state and hence was under the spotlight in the campaign. My parents were visiting during the primary season and I explained the process to my father. He was quite impressed by the debates, the process and the transparency of the whole thing. He got to see Kerry speak on the steps of the Pennsylvania Capitol when Kerry visited the burg. I was also intrigued by the process and was actually looking forward to the election results in November 2008. We all know what happened thereafter. That was 4 years ago. I am back in Washington DC this year and I must say I have come a full circle. I have been chatting a lot with a friend about the elections and the candidates etc. Over these conversations I realized that I am back to being that teenager again. I have become apathetic and aloof to this election. Don’t get me wrong, it’s not because I am not entitled to vote, or it’s not my country. I am still contemplating on what is it that changed? I have simply stopped caring. No candidate or no speech (no matter how rousing or earnest and honest it is) seems to stir me. The outcome of the elections does not matter, how we get to the outcome does not matter and what happens after that does not matter. I am trying to tell myself that it should matter and that all this is not a farce, but every time I try to reason with myself, all I hear is – “What’s the point? What a waste of time!”. I only feel a tremendous hollowness in everything the candidates preach. The ads on TV make me cringe, the slogans and the promises bring an involuntary cynical expression on my face and my hands immediately reach out to the remote to search for any channel that plays “Seinfeld”. I hear you’re feeling down. I’ll need some information first. Your lips move but I can’t hear what you’re saying. There’ll be no more aaaaaaaaah! I do believe it’s working, good. Come on it’s time to go. Most of you who have ever listened to the music of Pink Floyd, the cult band of the 60s/70s, know this number from The Wall. I have my own distinct memories of when I first listened to this ballad. Why do you say, I am bringing up this song today? Last week, two more Indian cities fell victim to the terror that has been hounding the country for decades now. More people die, more fingers are pointed, the media screams with made-up pathos, we “tch tch tch” the victims for a day or two and then the blood is hosed away, the pieces of flesh and bones are picked, the bombed vehicles impounded and we all move on. Have you noticed that lately this “Moving On” is happening with more and more alacrity? This is not how we were – we used to have a passion for fighting for our rights – we consistently endured and drove away external invasions for centuries – from Alexander to the Queen. Today, we cannot beat the demons within ourselves, today our passions are reduced to IPL, the capitalist way of living, fast cars and voting for IDOLS – you get my drift. Not that there is anything wrong in nurturing a passion for these things, but where is our fighting spirit when it comes to fighting for the basic needs that a Government should provide its population – clean water, electricity, food, and above all SAFETY for its hardworking citizens. We take to the streets to oppose the scantily clad cheerleaders, to protest against a painting, to protest against a bridge in the ocean, against a book or even a Rakhi Sawant – but when it comes to bringing our rulers to task for the lack of basic needs we look the other way. Where has that fire gone? Where has that spirit disappeared? Have we all become “Comfortably Numb”? The air is thick with the upcoming Presidential elections and the ongoing Primaries. It was February 2000 and the atmosphere was similar. President Clinton was finishing his second term and Al Gore and Governer George W Bush were the contenders for the White House. I was a FOB (fresh of the boat) then, did not quite understand or care about the elections. By the time it was November 2000, I was actually living within 10 miles of the White House. The 2000 presidential elections became famous or infamous for a variety of reasons. After the bitter battle, George W was declared winner and the rest is history. On December 13 2000, Al Gore conceded his defeat. I remember watching Al Gore’s Concession Speech on CNN. This was my first experience to true “Americanism”. Even today this speech resonates well and talks about the essence of a true Demoratic Nation. The next day Thomas L. Friedman voiced his opinion with an incredible article. Cannot remember when was the last time so little words made so much sense. Whenever I leave this country for good, along with the material things I would take with me, its the exposure, understanding and seeing these values being put to use – is what would make the time I spent in this great nation worthwhile. I was shocked when I first heard the news of the Benazir Bhutto assasination. However, I was shocked even more by the quick “Martyrdom” granted to her and by the Western media’s portrayal of her as the only beacon of “Democracy” in Pakistan. Her regime was probably more anarchic and corrupt than Mushy’s. These topics were quickly swept under the carpet and the TV channels were repeatedly beaming her Western accented English interviews with the likes of Wolf Blitzer.